12:00 midnight—Today my 12 hour shifts began. This is an amazing experience. I am loving my time onboard the ALBATROSS IV. It is quite exciting. Today was outstanding. I am experiencing being a researcher at sea. The ALBATROSS IV has 12-hour shifts. The researchers are organized into two different shifts which are each 12 hours. I am on the midnight to noon shift. It is very different than my “teacher hours”. I usually work from 7:30 to 5:00 at school. I am only required to be at school from 7:45- 3:15, but I can never accomplish all of my responsibilities in that brief of a time. I love school and I love being prepared. To work on the ALBATROSS IV, you need to be prepared and ready for a hard day’s work! I am loving the work and at this time it is not too hard. Steve is assisting with sending the dredge into the water. It is about 2 am and we are 2 hours into our watch shift. The dredge is over 1,600 lbs. and there are many pieces of equipment that help the dredge function properly! I am a working member onboard the ALBATROSS IV. I am making every moment count and I am learning so much. The dredge haul experience is unbelievable. There are two fishermen that help to release and the dredge. The two fishermen on my watch are Steve and Mike. They are amazing at fixing the net, loading the dredge, releasing the dredge, retrieving the dredge, cleaning the deck, helping to sort the organisms in the tow, and so much more. These fishermen have the expertise of sending the dredge into the water and helping it return back after a 15-minute tow. The Chief Boatswain (head fisherman), Tony, controls the mechanical devices that assist the fishermen in sending the dredge to sea. Tony is so talented. He has the ability to communicate and accomplish any task onboard the ALBATROSS IV! The fisherman and all the scientists on my watch observe the dredge coming onboard the ship. Once the dredge is on deck there is so much to do!!! When the dredge returns from being in the water for 15 minutes, there is so much to do. First, the fishermen need to bring the dredge up on deck. There are strong metal wires that bring the dredge up on deck. There are metal pulleys that help move the wire. There are mechanically parts that are controlled so that the dredge lands on deck without damaging anything… including the dredge. The entire process is so awesome and neat. The scientists are all so excited to discover new things in this pile. Every dredge tow is full of biotic and abiotic items. It is so wonderful to discover new things. After the dredge is placed on deck, the fun begins. First, a scientist checks the dredge to see if it laid correctly on the ocean floor. The equipment that records the behavior of the tow is called an inclinometer. The inclinometer is placed inside the top of the dredge and the information is recorded. The scientist then needs to go to a different room to read the information from the inclinometer. It is an interesting piece of scientific equipment. The next experience is the best!! After a quick photo of what materials are found in the dredge, all the scientists gather around the dredge materials. We all marvel at what we dredged and then sort the items. We place all fish in one bucket and all skates in another. The scallops are all collected. The scallops are even organized by size. (Very small scallops are placed in a different bucket.) All the extra items go in a different bucket. When all biotic items have been discovered, then we shovel all the “habitat” (rocks and sand) into baskets. Every object that lands on deck is counted and documented. 8:00 a.m.—Breakfast. Yummy! Breakfast is one of the best meals of the day. Great food and selection. 9:30 a.m.—I went to the local post office! I went to the Marine Biological Laboratory. I viewed information on the Alvin launch in 1964. This submersible is amazing! It can withstand such water pressure changes. Science Rules! 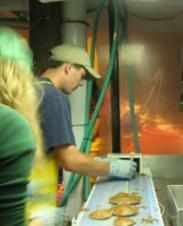 11:00 a.m.—Sea Scallop research and information: Presentation by Victor Nordahl: Chief scientist! The dredge has an 8-ft. wide opening and a sweep chain. This opening moves across the bottom of the ocean floor collecting organisms. The sweep chain is heavy metal that holds the opening … well… open! The dredge has a net liner and its purpose is to keep fish and scallops in the dredge. The liner is often damaged by rocks & boulders that enter it. 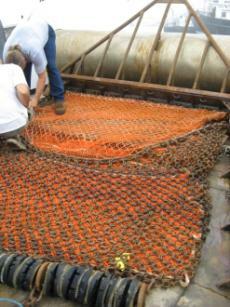 These 2 scientists are repairing the ripped net liner on our standard dredge. On a common dredge found on fishing boats, there is no liner. Fishermen finding scallops do not want to catch & analyze fish. They just want the scallop meats. As scientists, we want to study everything. The basic dredge haul provides us with lots to study. 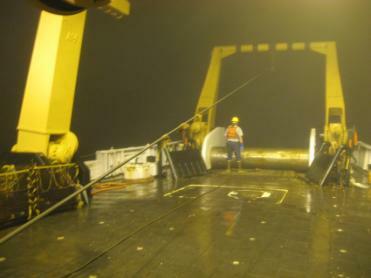 It is 7’ wide metal rod covered with rubber disks across the bottom of the dredge. There are dumping chains attached to the clubstick that help with the dumping of materials out of the dredge. The dredge goes out three times the water depth. For example: If the water depth is 100 meters, the dredge will send 300 meters of metal cable out. To calculate the distance of the dredge from the ship, you could use the Pythagorean Theorem (a^2 + b^2 = c^2. BUT the net curves & the equation doesn’t give you the most accurate results. So, you can calculate the amount and make a estimate of the net distance from the ship. In this example, the dredge is about 260 meters away from the ship. The dredge’s bag has an opening where all the organisms enter. The ring bag is built to hold rocks, living organisms, movement on the floor, and store many organisms for study. 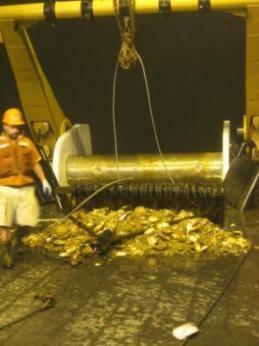 The dredge sometimes needs to be repaired due to weather conditions or course substrate (items found on the ocean floor). LOOK at the dredge above. This is showing the longer top side. Try to imagine a metal opening on the other side. This opening is about 6 feet from the top of the dredge. When the dredge is in the water, the longer side is on top. The part with the opening is found underneath. The dredge runs along the bottom floor and collects the organisms. It is amazing how many organisms you can find on the ocean floor. It is incredible how many diverse species are located in the Atlantic Ocean. This dredge collects organisms from the ocean floor. Notice the strong metal cable and metal pulley which help to reel the dredge back onto the ship. The roller helps move the dredge in and out of the water. When the dredge is empty, it weighs 1600 pounds. 1. What is range of the scallops? Do you find them in shallow water? Do you find them in deep water? Where do scallops prefer to grow and survive? Do we find more scallops in areas of a smaller rocks, bigger boulders, or small particles of sand? 2. Scientists can estimate how many scallops we will find. 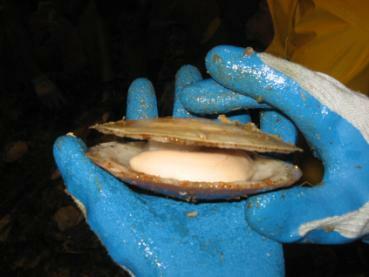 Marine biologists would like to learn more about the population of scallops in various areas. Scientists would like to come to an understanding about where most scallops reside on the ocean floor. 3. Scientists have randomly selected stations from Cape Hatteras, NC to Georges Bank (east of Cape Cod). 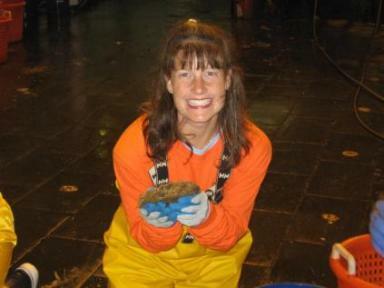 An area close to Nova Scotia is where scientists test to see the existence of scallops. I ask: Why will the population be different? I ask: What makes one species survive and another species not survive in an area? What temperature is the best for sea scallop survival? (The most important temperature is one that produces the most spawning. When more scallops are born, then more scallops survive. How much do the fisherman make for spending a day at sea catching scallops that they sell to the local restaurant or buyer? It is a gorgeous view of the sunrise from the back deck. 6. 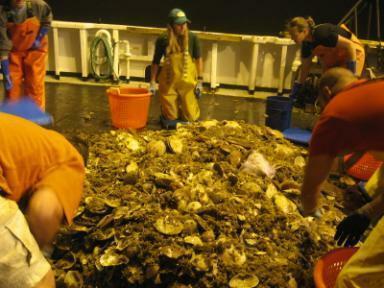 How can scientists protect fisheries (the scallops) and those who harvest them (the fishermen)? 7. Various universities, scientists, and government agencies closed water areas around Nantucket in 1994. In this area, no fishing or dredging is allowed. All citizens must not remove anything from the area. If you have a permit to fish, you need to be knowledgeable of the fishing rules. When water areas are closed for fishing, you need to know where they are and what to do. When they closed the area, the fish did not return. The scallop population has greatly increased. 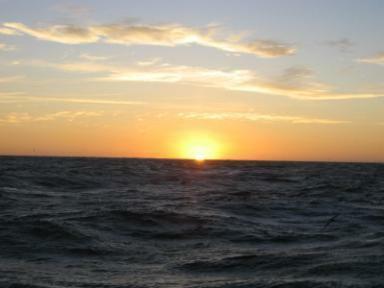 Many areas of the ocean are under a rotational management plan. (This is also called limited access areas). In these areas of the ocean, fishermen are allowed into an area for various times. Sometimes fishermen are not allowed to capture a specific type of fish. There are times when fishermen cannot collect any scallops. These rotational management areas are created due to research and scientific studies that are completed at sea. In other words, all the scientists onboard the ALBATROSS IV are making a difference in the regulations that fishermen adhere to. Scallops are a resource. They are a biotic (living) thing. Many people spend their lives harvesting this resource from the ocean. Many people spend their lives eating this resource. No matter who you are, you can impact the health of the water and the home to this resource. We all need to make an effort to protect our waterways and care about the resources that benefit our lives. This was the basic size of a tow. It is incredible how many organisms are found in one dredge tow. It is beautiful to see such amazing animals from our ocean. 9. Here is a small lesson about how the stations are randomly-generated. First, think of an area in the ocean. Then, divide that area into 100 squares. Next divide those 100 squares into small areas. The randomly-generated stations are determined from all those small areas. Finally, the researchers need to decide the best way to travel to all of those randomly-generated areas. Do ships have the same power, dredge, wire used, and same liner? If the equipment is different, how can we control bias? Do the ships test areas with the same water level, salinity, disease, same amount of fishermen in the area, wind, etc.? There are so many factors to consider and to control! 11. The ALBATROSS IV keeps a constant 3.8 knots speed when the dredge is out in the water. The ALBATROSS IV can reach 10- 11 knots when cruising along. I think it is an amazing how it feels on the water. 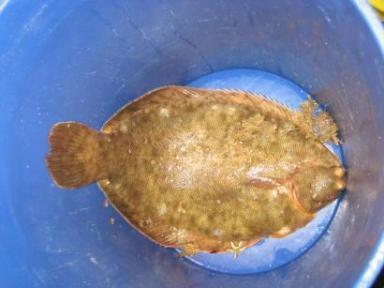 This is a winter flounder. It is a resource to many fisherman. There were several types of flounder in each dredge tow. 12. The sea scallop study is a great arena to start an ecosystem investigation. We need to know more about other organisms to determine details about ecosystem! Animals help and hurt each other. 13. As a scientist, you map habitat with a multibeam, tow camera, and dredge an area. The dredge validates the information from the tow camera. (The efficiency issue is solved.) The multibeam shows the entire habitat and determines everything there is to validate animal documented. 14. There are so many characteristics about the sea scallops. On the ALBATROSS IV, many procedures are followed for each dredge tow! There is an inclinometer on the dredge. The inclinometer will show if the dredge flipped. When sorting the tow, there are procedures to follow. Always sort what is in front of you. By sorting all animals right in front of you, true randomness and validity of diverse sizes are discovered. Place all fish in one bucket. Put all skates in one bucket. Place all crabs in another (if you need to collect them.) Put all small scallops in a blue bucket. Place all large and medium scallops in another bucket. Put all other animals in another bucket. Place all “habitat” in an orange basket. What do sea scallops eat? Well, they eat starfish. They eat the Asterias Boreal and Elptarstius Tenera. So neat. Wood’s Hole is an amazing place of nature, water, and other environmental benefits. Notice how many boats & people benefit from the water. 7:15 a.m.—Breakfast. I met many scientists, crew, teachers, officers, & more… details about Sea Scallop Leg III will occur at 10 am. Awesome food for breakfast. 8:30 a.m.—Free time in the town. 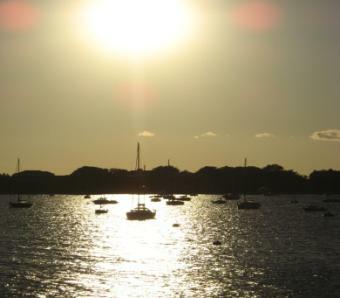 I saw the countryside, the marina, & visited the town of Wood’s Hole. We had a scientist’s meeting for all watch shifts. (I am on the 12 a.m. (midnight) -12 p.m. (noon) watch.) We discussed expectations, responsibilities, and ideas about this adventure/experience. We were informed of sexual harassment, drug possession rules, and other NOAA policies. I clearly understood my expectations and responsibilities. The ALBATROSS IV is 187 feet in length, 38 feet in width. The major reason that the ALBATROSS IV is out to sea is to learn more about the sea scallop population. We sample for sea scallops from Virginia to Eastern Georges Bank (off the coast of Nova Scotia). This is the Leg III of the Sea Scallop study. We will be surveying sea scallops from Northern part of Georges Bank that borders on the Gulf of Maine to the Great South Channel east of Massachusetts. The dredge is towed for 15 minutes at a speed of 3.8 knots. The dredge covers about 1.0 nautical miles of ocean bottom. A nautical mile is compared to 1.15 land mile. How many students in my class have been to the ocean? How many students in my class have touched an aquatic or marine organism? How many students can name 10 different aquatic organisms? How many students have been on a large ship or cruise ship? Sea scallops are collected, measured, and weighed. This scallop is upside down. The top of a scallop is more convex (curves out) and the bottom of a scallop is more flat. Do you see how the convex side (the top of the sea scallop) fits nicely in your hand? The white area you see is the male gonad of the sea scallop. The fleshy, white section that a customer eats is found deeper inside the sea scallop. 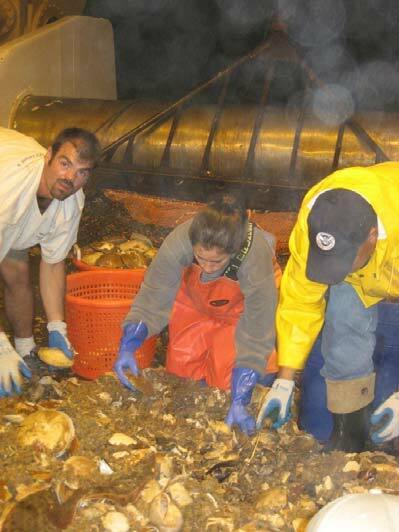 All the diverse organisms we find in the dredge are collected in blue buckets. Each organism is sorted by type and measured individually by a researcher. Many studies are being conducted onboard the ALBATROSS IV. Some of the studies include: sea scallop shell analysis for age, sea scallop size analysis, sea scallop health analysis, human health when consuming sea scallops, skate analysis, populations of starfish and crabs, water characteristics are analyzed, and so much more. The focus of the ALBATROSS IV’s voyage is to count the number of sea scallops from each dredge. The scientists also collect fish, skates, and other unique organisms at each station. Shawn McPhee & Adrienne Heim are measuring scallops. 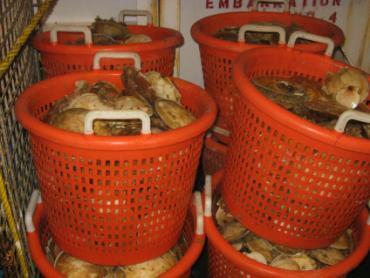 Over 350 scallops were collected on one dredge haul. The fish include American plaice flounder, Atlantic Hagfish, fourspot flounder, goosefish, longhorn sculpin, northern sand lance, ocean pout, red hake, sea raven, windowpane flounder, winter flounder, yellowtail flounder, and more. The skates include barndoor skate, little skate, winter skate, smooth skate, and more. Unique organisms include octopus, squid, and lobsters. If there are more scallops than we can sort or measure, we conduct a subsample. A subsample is when you choose a smaller amount to measure and expand by volume. For example, if you have 10 baskets of scallops, you choose 5 to measure and your expansion is two. Orange baskets hold “habitat”. Abiotic habitat items include rocks, boulders, gravel, sand, and shells. Biotic habitat items include: brittle stars, shrimp, sand dollars, clams, and spider crabs. All of these biotic and abiotic items are counted and documented for each station. The number of crabs and starfish is calculated every third station. The CTD shows the details of the water column and helps determine where scallops are found. The dredge is equipped with an inclinometer. This equipment is a sensor that measures dredge angle relative to the bottom of the ocean floor. The sensor has an internal clock that allows us to determine the amount of time that the dredge is on the bottom and in fishing position. We collected this many sea scallops from one dredge. It is outstanding how many scallops live in one area of the Atlantic Ocean. I counted and learned details about scallops. Would you be a researcher out at sea(on the ocean)? If you had the chance to investigate the number of sea scallops in an area of the Atlantic Ocean, would you go? Why are research vessels, like the ALBATROSS IV, so important for the study of science? Sea Scallop study and investigation. FDA sea scallop study. The FDA is dissecting and analyzing the health of the sea scallops. The sea scallop gonads and viscera are being tested for hazardous toxins: a marine biotoxin called saxitoxin. It causes PSP: Paralytic Shellfish Poisoning. The sea scallop is unharmed because saxitoxin is part of their diet. The sea scallops are filter-feeders. The saxitoxin is produced by a dinoflagellate called Alexandrium Species. Saxitoxin is a neuron toxin that affects your nervous system. It specifically causes concerns in the nervous system where your breathing and muscle movement is controlled. If saxitoxin is consumed by a person, the affected person can be incubated (a tube is placed down your throat and air is forced into your lungs), then you will be fine. If you do not seek medical attention, you will have major difficulty breathing and the person will have concerns with their nervous system (all other functions). Not good!! There are 3 outside wet work stations, inside dry station, CTD station, Watch Chief station, and more! There is a galley, Researcher work areas, hurricane deck, computer room, Officer’s staterooms, our living quarters, exercise room, “the bridge”, and other areas that I will discover throughout the boat. There are 14 scientists onboard this vessel. I am one of those scientists. It has been stated that the research collected would not be possible without the help of volunteers. Very cool. I feel like I am an important part of this journey out to sea. Important fact: When I am on watch: It is so important to take everything with me! Do not go back to the room. Be sure to have your computer, notes, change of clothes, and more. Be prepared. All stations (randomly picked sites) give scientists about the sea scallop population and details about their survival. Victor has a map posted in the dry lab. It is awesome. It is really, really cool and neat. Victor stated over and over again!!!! ASK QUESTIONS! What is the basic sea scallop population in the Atlantic Ocean? How do the populations change from one site to another? The distribution is relative to depth, latitude, bottom type, and temperature/ salinity! If we go to an area more shallow we will not locate as many sea scallops. Why does the population change over several years in the same area? Recruitment is a factor. This means that baby scallops larvae will settle in an area and they will grow. In what water depth can you find the most sea scallops? Why? What environmental conditions are best for sea scallop survival? In what other areas of the world are sea scallops present and prevalent? What helps the sea scallops survive? Fire/ collision drill: bring life vest and emergence suit; go to the wet lab and listen for announcements Abandon ship drill: 7 short sounds and one long sound ; bring life vest, emergent suit, long sleeve shirt, long pants, and go to raft #6 Man overboard: go to lookout area and point the entire time! 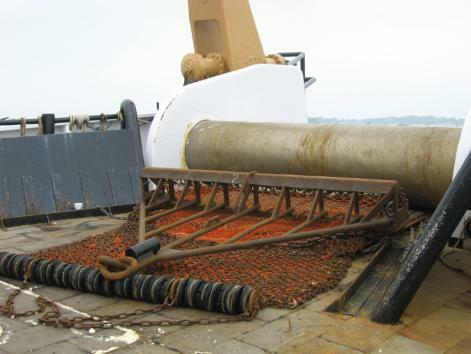 This is the standard dredge that is extremely important in collecting sea scallops from the ocean. Always report concerns! Be vocal when you have a problem and let’s solve it. Please don’t keep it inside and cause you concern… share what you feel. This Sea Scallop survey has viewed, documented, and calculated organism counts in over 500 stations. The Sea Scallop survey is analyzing information about the location of sea scallops, the growth of sea scallops, and so much more. The Chief Scientist, Victor Nordahl, would love to use this information about sea scallops to begin more studies about the ecosystem. He stated “The sea scallop information is an excellent start to understanding the entire make-up of the ecosystem where the scallops are found. If we discover more about where we find the sea scallops, then we can help the sea scallops and more organisms survive. The ALBATROSS IV may be retired soon. The boat has experienced and investigated numerous events. The vessel is beginning to show wear and tear. It has equipment that shows age and needs repair. Each boat needs to stay in compliance with NOAA standards and the ALBATROSS IV continues to make repairs to keep up with those standards. The major goal of a research vessel is to collect accurate and reliable data. When an old ship is retired (no longer used to collect scientific information), then scientists need to compare the equipment on the old ship with the equipment on the new ship. This is called calibration. The new ship will use information from the old ship for at least one year. The data needs to be compared and analyzed because all data is used for long-term studies. If one ship makes scientific conclusions and another ship makes conclusions that are totally different from the first ship, then the data is not valid. The data could not be used and the scientists work would be a waste. So, NOAA and other research companies who collect scientific data need to make sure that their research procedures are accurate and reliable. We will actually collect information about the sea scallop population using 2 different nets. The information will be analyzed and conclusions will be calculated about the reliability of the different dredges. The research outcomes will allow scientists to determine how the dredges and nets are different. The scientists will calculate the differences between the equipment and make a calibration. Neat stuff. 10:45 a.m.—Tour of Marine Biological Lab. Bill Kramer, an information technology scientist for NOAA, gave us a tour MBL (Marine Biological Laboratory). We learned about the marine environment and observed animals in the aquariums. 12:20 p.m.—Lunch. Excellent selection and many healthy choices. Great food. 1:20 p.m.-12:30 a.m.—ALBATROSS IV needs a special type of fuel/oil. We had free time. I explored Wood’s Hole on 8/6/06, so I took the ferry to Oak Bluff! It was outstanding. I did get caught in an enormous rain storm, but I made it safely to Wood’s Hole. I am so honored to be a part of the NOAA crew and I look forward to my adventure! I had the chance that night to speak to many other volunteers. We stayed up and talked all evening about our ideas and hopes for this trip. We are all excited and motivated to be a part of the crew of the ALBATROSS IV!! I am very enthusiastically anticipating what I am going to do and what I will learn. Will I personally collect sea scallops? I think so! Will I see other marine organisms? Whales? Dolphins? Fish? Birds? I hope!! How can I motivate my students to be life-long learners? Smile and share stories of my adventures at sea! How many of my students participate in fun summer activities involving science? I do hope that many students get involved in science camps and more. After I return, I plan to share stories and I hope this motivates them to attend science events!! Why should students want to be scientists and researchers? I think it is obvious!! Science rules!!! How will I help the marine organisms survive or how will I make a difference in the lives of others who study marine life? Be happy! I am so excited and I am ready! 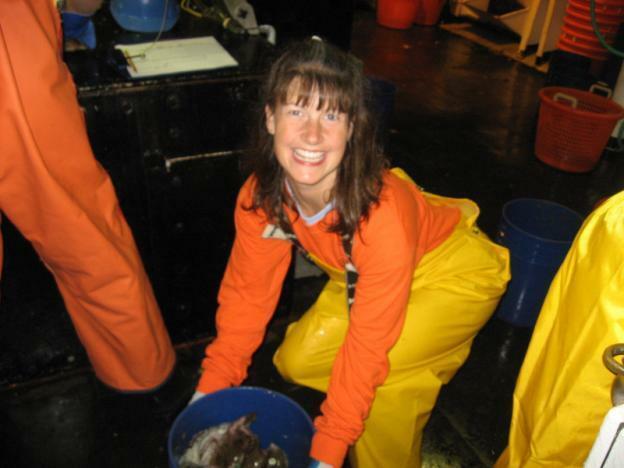 NOAA Teacher at Sea, Elizabeth Martz, works aboard NOAA Ship ALBATROSS IV. 12:50 p.m. I boarded the airplane at BWI for its journey to Boston, MA. This little plane handled the changes of air pressure, air currents, take off, landing, and so much more… Excellent experience. I documented my journey in the air by taking numerous pictures with my camera. This photo shows the details of the land about 25 minutes into flight from BWI to Boston. 3:20 p.m. Bus to Wood’s Hole: It was an experience. I loved the plane ride. I did not enjoy the bus ride. It took forever to reach Wood’s Hole. 6:30 p.m. Arrive on NOAA boat: Awesome vessel! I discovered details about the ship’s size, location of my room, crew members, & security personnel. 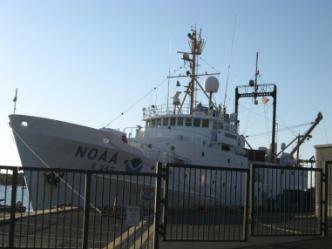 I am so thankful that NOAA allowed me to stay onboard the ALBATROSS IV the night before I began my duties as a researcher. I was able to see and understand more about the life on a sea vessel. The ALBATROSS IV is docked at Wood’s Hole preparing for its journey on the high seas. It is an impressive ship. Other volunteers arrived to board the ship. Adrienne, a Teacher from New York, teaches Spanish and more. Vickery and Greg are scientists from the FDA (Food and Drug Administration) who are researching the Sea Scallops. Sean, cousin of the Chief Scientist, is heading towards a degree from the University of Maine. We are all enthusiastically ready for this trip on board the ALBATROSS IV. 7:00- 11:50 p.m. Walked at Wood’s Hole: I am so impressed by this town (small & sweet). I had dinner at Shucker’s Seafood Restaurant. Yummy! Upon returning to the boat, I talked with scientists and security about their experiences and what they love about being out at sea.